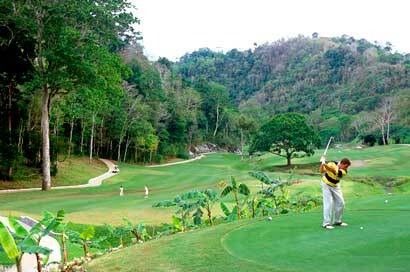 Golf is one of the fastest growing sports in Costa Rica. Because of its topography, fauna, flora and weather, Costa Rica is a golfers paradise. The price for a round of Golf is reasonable and tee times are always available. The best thing about Golf in Costa Rica may be the fantastic scenery with beautiful ocean, mountain and jungles views around every turn. There are 6 main Public Courses in Costa Rica designed by well-known Golf Architects like George Fazio, Robert Trent Jones, Jr., Ted Robinson, Jr., Mike Young and Tracy May. Prices range from $30- $125 per round with a cart, caddies and rental clubs are also available. Carved into an exotic rainforest with beautiful ocean views of Costa Rica’s Pacific Coast, the Los Suenos Golf Course located near Jaco, offers an extraordinary encounter with nature at every hole. This 18-hole, par-72 championship course, designed by Ted Robinson Jr., combines incredible scenery with challenging golf. Each hole bears a name that reflects its character. “La Culebra” or “The Snake” is named for its winding progression, while “La Ceiba” is marked by an impressive Ceiba Tree, the hallmark of the resort. It is not uncommon to see Monkeys, Sloths, Toucans, Scarlet Macaws and Pizotes while playing this beautiful jungle course. Prices range from $75-$125 with cart included, caddies and rental clubs also available. Parque Valle del Sol is located about 15 minutes from downtown San Jose in sunny and scenic Santa Ana. The 18-hole course designed by Tracy May has incredible panoramic views of the mountains surrounding the San Jose Valley. This par 72 championship course offers ample fairways surrounded by majestic trees and 15 large lakes which attract more than 20 different bird species. The course is challenging for highly skilled golfers, but also enjoyable for those with less experience. Prices range from $50-$75 cart included, caddies and rental clubs are also available. The prestigious and private Cariari Country Club is located just 15 minutes from the Airport in San Jose. This George Fazio designed course is both beautiful and extremely challenging. Most of the holes are long and narrow, and if you golf like me it may take you 18 balls to get through 18-holes. If you stay at the Cariari and Herradura Hotels you can play 18 with a cart for about $100 cart included, caddies and rental clubs are also available.. The Royal Pacific Golf Course was completed by designer Ron Garl in July of 1997 and is located just down the road from Garra de Leon and Flamingo Beach. The front nine holes are fairly wide open and require long drives; in contrast the back nine holes have more rugged terrain and tight fairways requiring accuracy more than distance. This course combines challenging conditions with the beauty of the Guanacaste countryside.. The Robert Trent Jones II designed Garra de Leon Golf Course serves as a magnificent centerpiece to one of the most luxurious resorts in Central America, the Melia Playa Conchal Beach & Golf Resort. Jones fulfilled his goal of creating another masterpiece, one that blends harmoniously into the natural Costa Rica countryside. With panoramic views of the Blue Pacific from many of the holes, the course meanders through rolling hills with sun-drenched fairways bordered by native forests. In addition, there are enough lakes and ravines to put a premium on accurate approach shots to large Bermuda greens manicured just like those at country clubs in the USA. The cost for 18-holes with cart is about $100, rental clubs are availables. It doesn’t take long to realize that Hacienda Pinilla is a very special place. The designers have worked very hard to create a golf experience that harmoniously co-exists with the natural environment. The par 72 masterpiece is the creation of Mike Young who has designed some of the finest golf courses in the southern United States. At Hacienda Pinilla, you'll see a shining example of Young's passion for the game, respect for tradition, concern for the environment, and sharp eye for detail. Each hole was designed to conform to the slopes and contours of the natural landscape. Hacienda Pinilla offers picturesque scenery, immaculate conditions and frequent glimpses of exotic wildlife. The cost for 18-holes with cart is $80 - $100, rental clubs are available. If you need information about golf and vacation rentals in Costa Rica and the Jaco Beach area send us an email or give us a call.